My summer began to wrap up a few weeks ago… I’m currently in France but I was able to spend a few days in Colorado with my family before taking off! I left Minneapolis bright and early and flew to Colorado to visit my older brother who lives in Denver. He, my parents, and I took a trip up to Vail and explored other parts of the beautiful Rocky Mountains! The blue sky in the mountains is downright beautiful! We took the gondola up the mountain upon arrival and hiked for a few hours. Fall has definitely arrived – the aspen were beginning to turn yellow, the ski runs were being groomed for winter and chair lifts were under repair. It was fun to watch the village prepare for winter, but I also enjoyed the off-season charm. Oktoberfest was going on and although it wasn’t much more than having a beer and a brat, I still enjoyed walking through the street admiring a few people dressed in lederhosen! Vail’s farmer’s market is one of a kind! 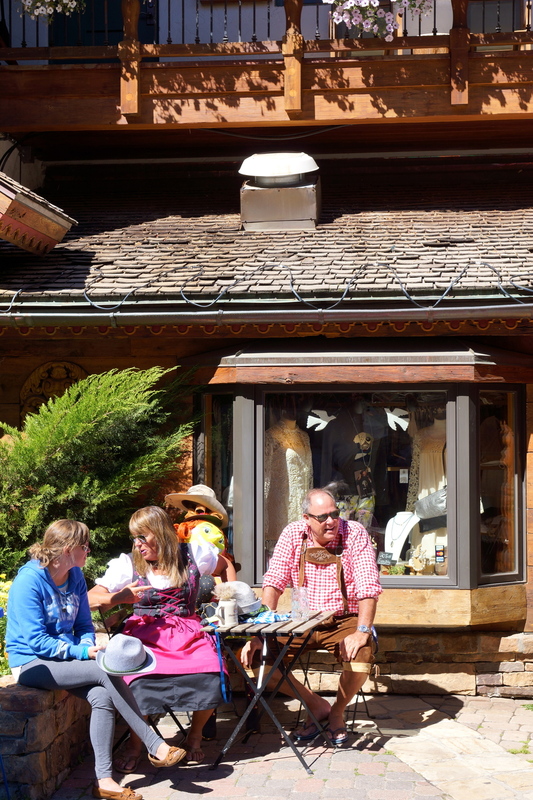 Dozens of local artists were selling everything from buffalo hide purses and laptop bags, to finely made cutting boards out of a variety of Colorado wood, to typical German food like sauerkraut, bratwurst and pretzels. Monday was full of surprises. I began my day sipping coffee in a robe and slippers (two of my favorite things). I think I could start every day that way, but I probably wouldn’t get too much done if I did. Every now and then, a vacation is good for the soul though… right? We decided to take off for another part of the Rockies and visit Glenwood Springs. One gondola ride later, we were at the mountain where the highest views of the canyons could be seen… there also happened to be an amusement park (Glenwood Caverns Adventure Park) on the top of the mountain. I only went on two rides, but they were two of the best I’ve ever been on! The Alpine Coaster was unlike any other alpine slide I’ve been on… I’d say it was a bit more like a roller coaster. When I got the green light to go ahead and the operator told me to go at full speed I did. I didn’t realize that I should maybe think about taking the corners a bit slower. That said I zipped down 3,400 feet of tracks at the speed of light! My adrenaline was still rushing when I was pulled back up to the top of the mountain… so much so that I agreed to go on the Giant Canyon Swing – a swing that launches you higher than the birds fly. My stomach began to turn as I watched others on the swing. Previous ride goers yelling, “Make it stop!” and “I’m gonna puke!” wasn’t exactly reassuring, but soon enough my turn came and I couldn’t back down once I made it that far. My mom and I had given my dad and brother endless grief for not joining us, so at this point we were obligated to give it a go. It was quite literally the scariest ride I’ve ever been on. After watching my life flash before my eyes on the rides, it was time for a little R&R. So, before heading back to Vail we went to the Iron Mountain Hot Springs where we watching paddle boarders glide by on the famous Colorado River and soaked in the pools for the afternoon. If you have the chance to visit… go! Enjoy the view and let the minerals soak in! One last morning in Vail (and my robe and slippers, of course) was all we had before slowly making our way back to Denver. We made a few pit stops along the way, took a short hike on terrain that felt more like Mars than Earth, and headed to the airport. It was a quick trip, but a fun one. I’d been itching to get on the move again and was delighted to spend a few days in the Rocky Mountains with the family!